The 18 kDa translocator protein TSPO localizes on the outer mitochondrial membrane (OMM). Systematically overexpressed at sites of neuroinflammation it is adopted as a biomarker of brain conditions. 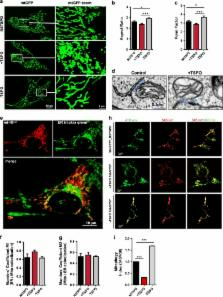 TSPO inhibits the autophagic removal of mitochondria by limiting PARK2-mediated mitochondrial ubiquitination via a peri-organelle accumulation of reactive oxygen species (ROS). Here we describe that TSPO deregulates mitochondrial Ca2+ signaling leading to a parallel increase in the cytosolic Ca2+ pools that activate the Ca2+-dependent NADPH oxidase (NOX) thereby increasing ROS. The inhibition of mitochondrial Ca2+ uptake by TSPO is a consequence of the phosphorylation of the voltage-dependent anion channel (VDAC1) by the protein kinase A (PKA), which is recruited to the mitochondria, in complex with the Acyl-CoA binding domain containing 3 (ACBD3). Notably, the neurotransmitter glutamate, which contributes neuronal toxicity in age-dependent conditions, triggers this TSPO-dependent mechanism of cell signaling leading to cellular demise. TSPO is therefore proposed as a novel OMM-based pathway to control intracellular Ca2+ dynamics and redox transients in neuronal cytotoxicity. Mitochondrial Ca2+ homeostasis plays a key role in the regulation of aerobic metabolism and cell survival 1 , but the molecular identity of the Ca2+ channel, the mitochondrial calcium uniporter 2 , was still unknown. We have identified in silico a protein (denominated MCU) that shares tissue distribution with MICU1, a recently characterized uniporter regulator 3 , coexists with uniporter activity in phylogeny and includes two trasmembrane domains in the sequence. siRNA silencing of MCU in HeLa cells drastically reduced mitochondrial Ca2+ uptake. MCU overexpression doubled the [Ca2+]mt rise evoked by IP3-generating agonists, thus significantly buffering the cytosolic elevation. The purified MCU protein exhibited channel activity in planar lipid bilayers, with electrophysiological properties and inhibitor sensitivity of the uniporter. A mutant MCU, in which two negatively-charged residues of the putative pore forming region were replaced, had no channel activity and reduced agonist-dependent [Ca2+]mt transients when overexpressed in HeLa cells. Overall, these data demonstrate that the identified 40 kDa protein is the channel responsible for Ruthenium Red-sensitive mitochondrial Ca2+ uptake, thus providing molecular basis for this process of utmost physiological and pathological relevance. Close contacts with the endoplasmic reticulum as determinants of mitochondrial Ca2+ responses. The spatial relation between mitochondria and endoplasmic reticulum (ER) in living HeLa cells was analyzed at high resolution in three dimensions with two differently colored, specifically targeted green fluorescent proteins. Numerous close contacts were observed between these organelles, and mitochondria in situ formed a largely interconnected, dynamic network. A Ca2+-sensitive photoprotein targeted to the outer face of the inner mitochondrial membrane showed that, upon opening of the inositol 1,4,5-triphosphate (IP3)-gated channels of the ER, the mitochondrial surface was exposed to a higher concentration of Ca2+ than was the bulk cytosol. These results emphasize the importance of cell architecture and the distribution of organelles in regulation of Ca2+ signaling. Fluorescence microscopy is one of the most powerful tools for elucidating the cellular functions of proteins and other molecules. In many cases, the function of a molecule can be inferred from its association with specific intracellular compartments or molecular complexes, which is typically determined by comparing the distribution of a fluorescently labeled version of the molecule with that of a second, complementarily labeled probe. Although arguably the most common application of fluorescence microscopy in biomedical research, studies evaluating the "colocalization" of two probes are seldom quantified, despite a diversity of image analysis tools that have been specifically developed for that purpose. Here we provide a guide to analyzing colocalization in cell biology studies, emphasizing practical application of quantitative tools that are now widely available in commercial and free image analysis software. Signal transduction molecules in the rat pineal organ: Ca2+, pCREB, and ICER. Functional organization of dendritic Ca2+ signals in midbrain dopamine neurons.